Rukhmar created the Arakkoa both in memory of and as a tribute to Anzu’s sacrifice – but she never really discovered what happened to him after Sethe’s defeat. She led her children from Gorgrond back to Arak, where they were destined to thrive. But immediately after their arrival, Rukhmar perished, her body devoured by flame. The Arakkoa were on their own. And they took Rukhmar’s death as a sign of their own ascendance. 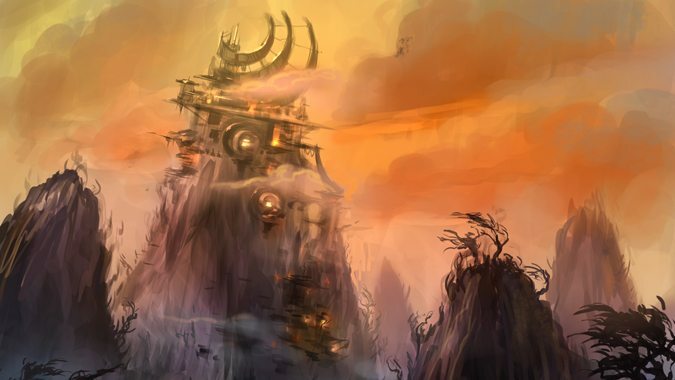 In honor of her, the Arakkoa vowed to create their own vast civilization on Draenor, one that would outshine any other and blaze just as brightly as Rukhmar had in the moment of her demise. They called themselves the Apexis, and quickly set to work carving a home out of Arak’s spire. The Apexis were masters of the Light just as Rukhmar had been – but they also had a deeper understanding of the arcane as well. Guided by tales of Anzu and his sacrifice, some Arakkoa sought out Sethekk Hollow, the site of Anzu’s fall. There, they found the last remains of Sethe’s curse, and began to unravel the mysteries of shadow magic and the Void. Empowered as they were by Rukhmar, the Arakkoa quickly understood that life was a balance of both Light and Void, and two factions eventually emerged in Apexis society. The Anshar focused their studies on the Light and holy magic, while the Skalax placed their attentions on shadow and arcane magic. Both held positions in the height of Apexis society, existing side by side as equals in influence and prestige. 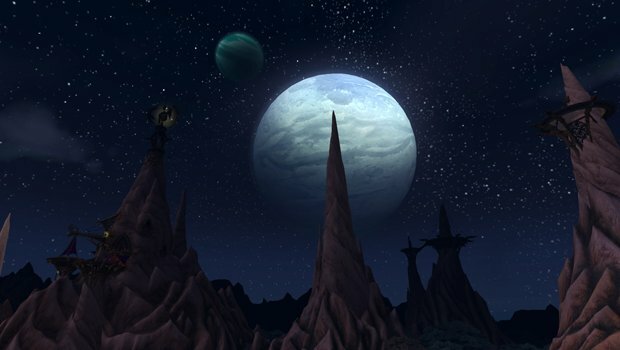 The Arrakoa didn’t seek to conquer Draenor, but they did want to understand it. So they explored, forging outposts to observe the forests and mountains, and the creatures that dwelled in both. Over time, they realized the land itself was the remains of giants that once walked Draenor. Thanks to the tales Rukhmar had told them, they understood that the Breakers and Primals were descendants of these giants. Fascinated, they watched the two forces war with one another, but never intervened – it was beneath the Apexis to interfere. Although the Apexis didn’t bother to interfere with the Breakers or Primals, the rise of their civilization hadn’t gone unnoticed. One great treant named Gnarlgar remembered the time before the Sporemound’s destruction, and eventually taught other primals the truth of their existence. Of all of the Sporemound’s descendants, the botani proved to be the most clever, and Gnarlgar taught them the ways of nature magic. Eventually, Gnarlgar noticed the Apexis. Their strangely crafted cities of gleaming metal were an affront to the natural world. And their mastery of magic that could burn entire swaths of forests in an instant was a danger to be reckoned with. Believing the danger that the Arakkoa posed too great to ignore, Gnarlgar sought out something that could be used to stop the threat before it could begin. And it found a giant fossilized root – one of the last intact remains of Botaan. With it, Gnarlgar hoped to revive the Evergrowth and put a stop to the Apexis civilization once and for all. After planting the root in Talador, Gnarlgar rallied the botani, who then willingly sacrificed themselves to bring a new Sporemound to life. Gnarlgar named it Taala – and as it grew and prepared to awaken, the Primals prepared for all-out war. At first, the Apexis ignored what was happening in Talador. After all, it appeared as though the Primals were simply preparing another attack against the Breakers. There was nothing out of place with that. But as the Primals began to encroach on Arak’s borders, the Arakkoa took notice, and slowly realized that the Primals were trying to recreate one of those ancient, powerful giants. If the Primals managed to successfully awaken the creature, Arakkoa civilization would quickly be snuffed out. Left with no alternative, the Anhari and Skalaxi rallied the rest of the Arakkoa into an invasion force, storming the skies over Talador. They ignored the rest of the Primal armies and instead focused on Taala. But they underestimated the strength of the Primals. Gnarlgar managed to enter a trance and reconnect all Primal life in that united sentience that made the Evergrowth such a dominant force in ancient times. As one sentient being, all Primals struck at the Arakkoa in concerted unison – and wiped out nearly half the Arakkoa forces at once. Shocked, the Arakkoa scrambled to the skies and retreated. The Anhar order had what they thought was a solution – a weapon they were working on, called the Breath of Rukhmar. 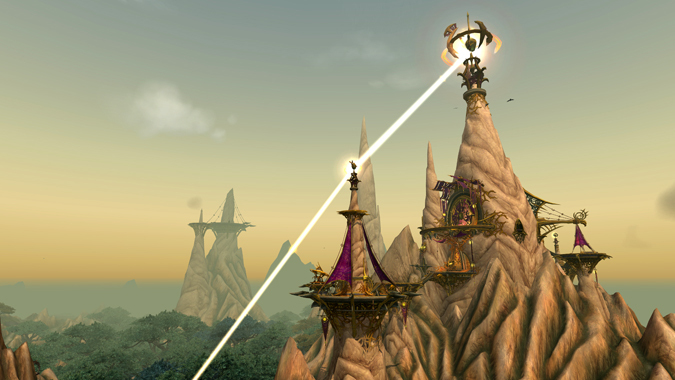 Used correctly, the Breath of Rukhmar could harness and channel the energies of the sun into a powerful beam capable of wiping the Primals out. But even as they hurried to finish the weapon, Taala finally stirred and awoke. Gnarlgar entered another trance, and the Primals worked as one – striking out towards Arak’s sole spire. The Anhari hastily worked to finish the Breath of Rukhmar, but they needed more time. In order to halt the progress of the Primal army, a contingent of Skalaxi sorcerers struck out to find the source of the Primals unique unity – Gnarlgar. 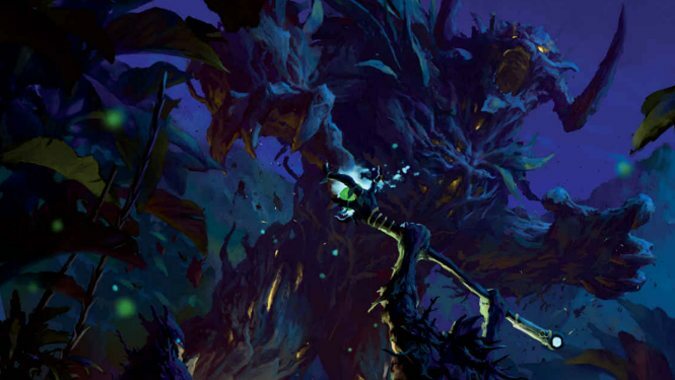 They were detected and slain by Gnarlgar, but not before they cast a dark and powerful curse on the creature, a creeping rot that withered the treant into nothing more than a husk. The unity of the Primals was shattered – and in that hesitation, the Anhari finished their weapon. The Breath of Rukhmar roared to life and in one violent act, ripped through Taala and reduced the creature to ash and char. Terrified, the remaining Primals sought a hasty retreat to Talador, but they couldn’t escape the wrath of the Anhari or the Breath of Rukhmar. A paltry few made it to Talador, the rest lost in a landscape of charred earth and ash. The Apexis won. Not only had they won, they’d done so in a manner so decisive that the Evergrowth would never return again. In the centuries following their victory, the Apexis civilization flourished into an all-out empire, the most powerful force in the world. With nothing even remotely powerful enough to deter them, they bent their minds to the study and advancement of science and magic. Eventually, the Anhari and Skalaxi became the caretakers of that wisdom, cataloging history, magic, and all knowledge the Arakkoa gleaned from the surrounding world. Instead of storing that knowledge in more traditional scrolls and tomes, the Anhari and Skalaxi sorcerers developed a different method of archival. Together, they crafted crystalline devices capable of storing vast amounts of information. 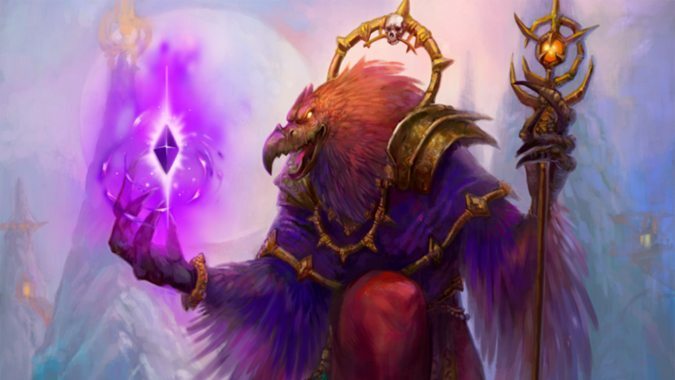 If an Arakkoa touched one of these crystals, they would quickly consume all knowledge stored within it. But this idyllic balance between Anhari and Skalaxi couldn’t sustain itself forever. 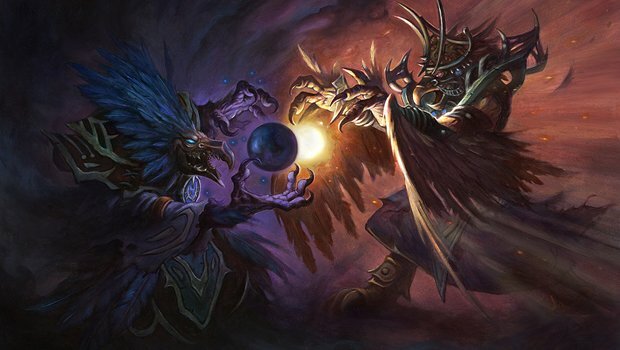 Eventually, the two orders developed a bitter rivalry, each seeking greater support from the general Arakkoa population. The Anhari quickly realized the easiest way to do this was to control knowledge by hoarding the coveted Apexis crystals. They managed to do this in secret for many years before they were discovered by the Skalaxi. The Skalaxi leader, Sorcerer-Lord Salavass, demanded the release of the Apexis crystals. 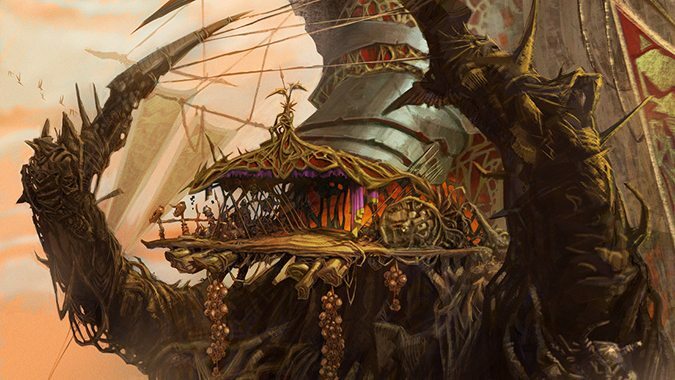 The leader of the Anhari, Priest-Lord Velthreek, refused, declaring the Anhari the sole rulers of the Apexis and proclaiming that the Anhari would decide who could access the crystals and the knowledge contained therein. On top of that, Velthreek declared that he and the Anhari were in fact the living representatives of Rukhmar herself. The only way to earn favor with their goddess would be to follow the Anhar order’s teachings in all things. Salavass was no fool – he knew if his order didn’t act, the Skalaxi would lose favor and eventually die out. Unwilling to let that happen, Salavass gathered his followers, preparing to strike at the sun temple and take the Apexis crystals by force. Civil war erupted as the rest of Arakkoa society chose between the two factions and joined the fighting. But the Anhari had a weapon on their side – the Breath of Rukhmar. And they wouldn’t hesitate to turn it on their own kind, if it meant an end to the war. If that weapon were allowed to go off, the Skalaxi were doomed. Salavass knew this, and gathered his most gifted sorcerers to his side, infiltrating the top of the spire where the weapon was kept. It was well guarded – the Skalaxi and the Anhari guardians immediately came to blows. As they fought, Salavass wove a spell meant to destabilize the Breath of Rukhmar – and it worked, with disastrous results. The weapon detonated. The force of its explosion ripped through the land itself, and Arak’s sole, glorious spire splintered and split into smaller pieces. The shockwave from the explosion left the surrounding land a barren wasteland. In that single, catastrophic moment, the mighty Apexis civilization was lost. Although the Apexis empire was gone, records and remnants of its vast records of untold knowledge remained – scattered into precious shards and relics. As the generations passed, the barren wastelands of Arak would once again bloom with new life, and the Arakkoa would eventually recover. But they’d never again attain the heights of knowledge and power they’d once possessed. They would, however, pass that knowledge on – and they’d find some of their most adept students in the descendants of Grond. Next time, we’ll look at the rise of the Gorian Empire, and the influence of the Apexis.